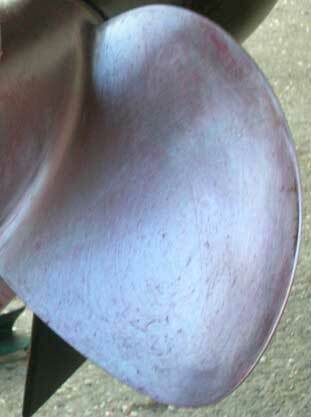 Propeller surface is prepared for application. 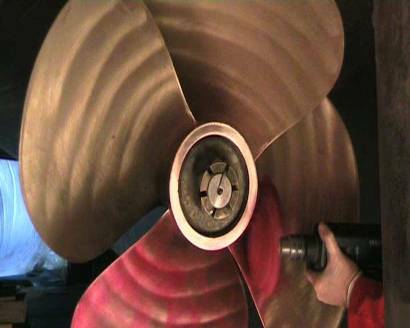 Any growth is removed and propellers are checked to ensure they are in good working order. The propeller surface needs to be taken back to bare metal using the appropriate equipment. Once fully clean the propeller surface then needs to be "keyed" ready to receive the product (this is also necessary for new props). The surface can be keyed by using 80 grade wet and dry sandpaper/emery paper or for larger props power tools can be used, i.e. sander or angle grinder with sanding attachment. The first coat can now be applied. 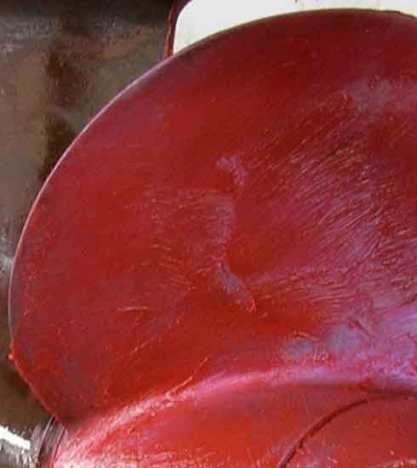 The product comes in the form of a thick paste which is initially brushed onto the propeller surface to form a thin coat, the coat is then rubbed well into the keyed metal by hand using a rag or for larger props using a powered rotary polishing mop. To save time rather than brushing on a first coat the product can be put straight onto a rag or a polisher power tool (i.e. 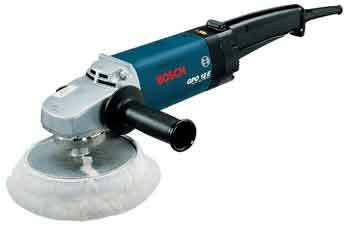 Bosch Polisher GPO 12 E Professional, see figure 1.3 below) and rubbed directly onto the surface. 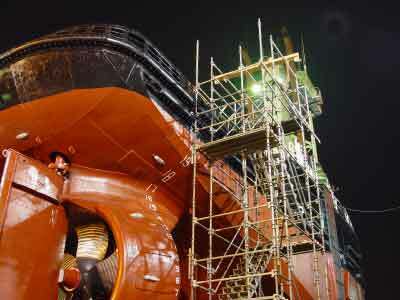 Either method produces a semi-transparent coating of Propshield Industrial over the whole of the propeller surface. 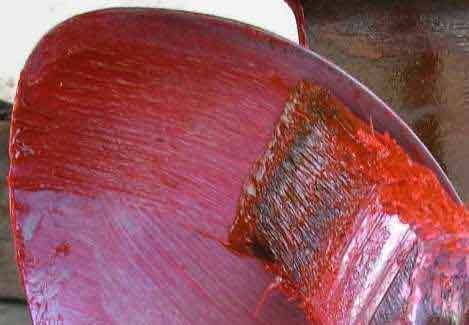 Using a polishing mop (see figure 1.4 below) will produce a redder first coat than using a rag (see figure 1.2 below). The second coat can now be applied. 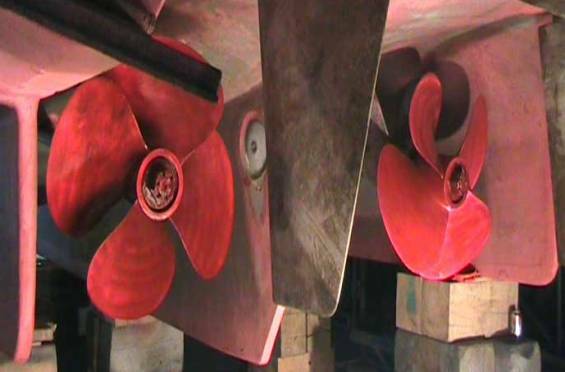 Using a suitable sized brush, or a soft bristled broom for larger propellers, a second much thicker coating of Propshield is brushed on top of the first transparent coat, see figure 1.5 below. This second coat needs to be thick enough so the metal underneath is no longer visible, see figure 1.6 below. 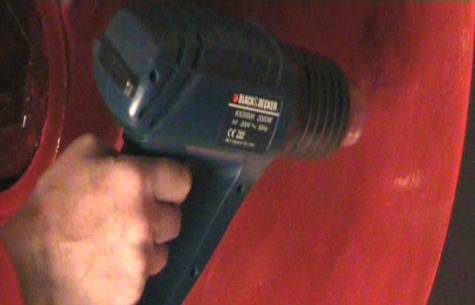 The coating doesn't need to be uniform in thickness however if appearance is important then a blowtorch/lamp or heatgun can be used to quickly skim over the surface to produce a pleasing even gloss finish to the coating (see figure 1.7 below). The coatings are now left to bond to the metal surface and to each other for approximately 1 to 3 days depending on ambient temperature. The vessel can then be launched.